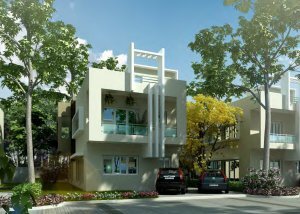 Type A Expandable Villas are 2 BHK villas with the option of expanding a room on the terrace. They offer you all the modern conveniences of staying in a villa and include a living room on the ground floor. Type A offers you a choice of 2 villa options: Front facing and Garden facing villa. Type B Expandable Villas are 3 BHK villas with the option of expanding a room on the terrace. They have been luxuriously arranged with a lot of space, and include a large master bedroom and a kid’s room on the first floor, and a guest room on the ground floor. Type B offers you a choice of 2 villa options: Front facing and Garden facing villas.